Buy Heather Hills Beeswax Candle - Bear Hugging Beehive in the UK from our online shop or directly from our independent Scottish store. A cute little honey bears climbing on old fashioned shaped "skep" beehives. Made from 100% pure, natural beeswax. These candles stand approximately 70mm high. Makes an ideal present - perfect for stocking fillers and wedding favours. They smell deliciously of honey & beeswax and look so cute you won't be able to resist them. 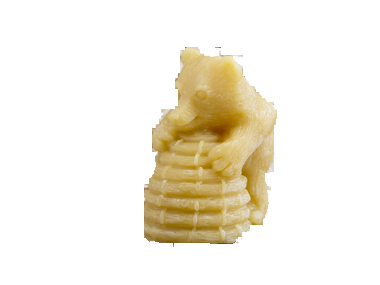 Where can you buy real Beeswax Candle - Bear safely online? If you are wondering where you can buy Heather Hills Beeswax Candle - Bear Hugging Beehive safely online in the UK, then shop with us. Beeswax Candle - Bear - Heather Hills Beeswax Candle - Bear Hugging Beehive in Gifts and Easter & Gifts.